Common Laurustinus (Viburnum tinus): growing, planting, caring. A strong, both cold and drought-resistant shrub with a winter blooming. 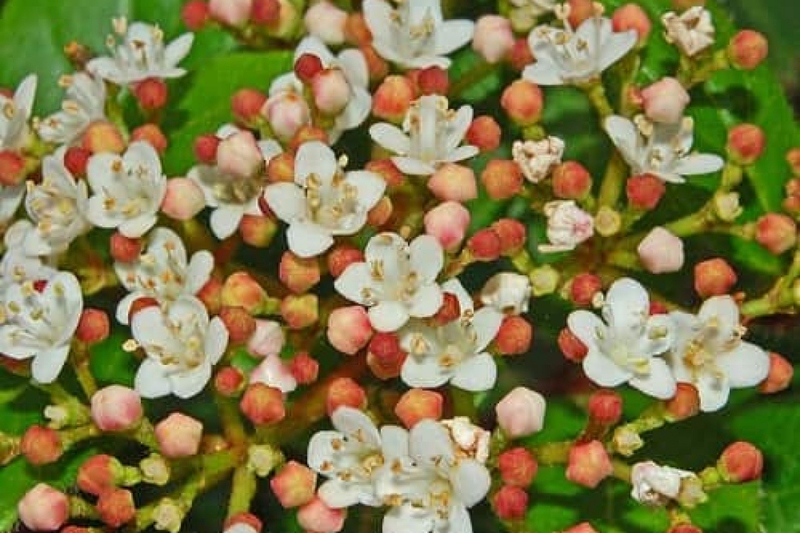 Viburnum tinus - the common laurustinus - is a species of flowering plant in the family Adoxaceae, native to the Mediterranean area of Europe and North Africa. It is a shrub growing 2–7 m (7–23 ft) tal with a dense, rounded crown, evergreen ovate to elliptic 4–10 cm long leaves borne in opposite pairs and small white or light pink flowers produced in dense cymes in the winter. There are three subspecies: V. tinus subsp. tinus, from the Mediterranean region, subspecies rigidum from the Canary Islands and subcordatum from the Azores. Common laurustinus - Viburnum tinus - is a Mediterranean shrub reaching up to 3 m in all directions, with evergreen, opposite, oval leaves, measuring 5 to 10 cm in length. It bears from autumn to spring tubular flowers organized in white terminal cymes. Plant your laurel from October to March, outside of freezing periods, as winter planting allows for better root development. Choose a sunny location that is sheltered from winds if possible! Laurel graciously accepts all kinds of soil, provided it's well drained, and eventually enriched with potassium. Don't hestiate to add sand and stones to the earth to help with drainage! Before planting, trim damaged roots and branches to balance the root volume and the above ground volume. Plant in a hole at least two times bigger than the root ball. Spray water on the roots before planting. This will greatly improve the chances of growth, no matter the conditions. Plant while taking care not to bury the plant's root collar. Form a basin around the plant's base, which will be used for watering the first months. Form a basin around the base, which will be used for watering the first months by tamping down the soil around the roots. Don't hesitate to use all of your body weight! Water until the planting basin is full — at least two watering cans! If you keep your laurel in a pot, plan to replace the topsoil with mature compost every 2 to 3 years. The Viburnum tinus supports pruning well: in February-March prune the entangled branches - which intersect - to keep a aerated shape. Renew the mulching in the fall at the base of your common laurustinus. Choose a mulch based on wood or bark, which will protect the soil longer.